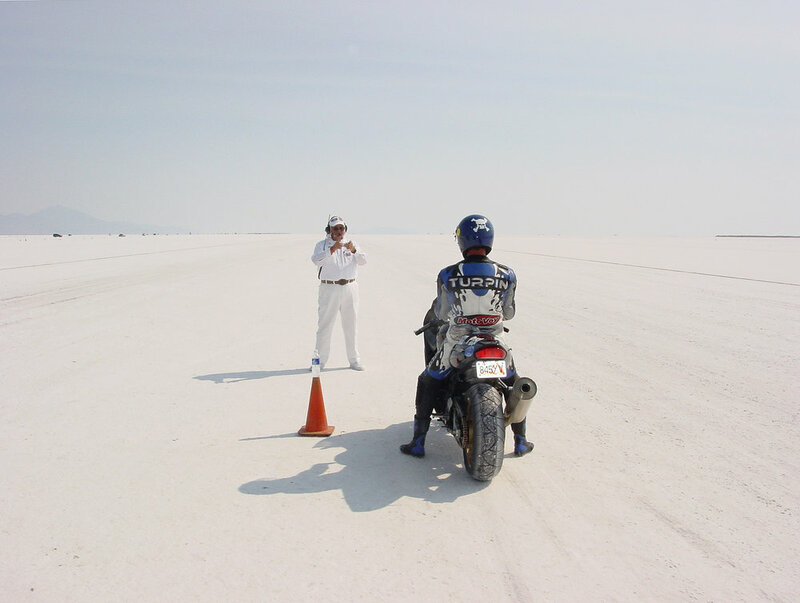 Archive | Like a dream of the future, Bonneville has been on my mind for a year. I finished my ‘20 Ford this year, and all along I’ve wanted to take it to Bonneville. The cowl of the car is a piece I found out in the sagebrush about twenty miles north of Lovelock Nevada. It’s uniformly rusted and shot full of bullet holes. Bringing the Ford to Bonneville seemed like a good homecoming for the car, taking it back to the desert, from whence it came. In order to take the Ford, I would have to take a trailer, which meant driving the RUST Magazine shop truck. However, the truck needed help. The old girl is a ’64 Dodge half ton, which ran great but smoked like a chemical fogger goin’ down the road. Time for a rebuild, says I. The lack of “long green” meant it would have to be an Okie rebuild. I would pop the head, and shove out the pistons, do a valve job and re-ring it. I proposed to hone the cylinders and replace the rod bearings but this course of action was sternly ridiculed by the boys as highly suspect behavior and furthermore definitely not Okie procedure. I did it anyway, but the rebuild took place underneath a pine tree so as to maintain the correct Okie attitude. One thing led to another, and thanks to my friend Frank Fidler, I ended up putting headers with an offy intake on the slant six. Of course this meant I had to put stacks on or the exhaust, with rain flaps naturally. All this was completed just before we left for speed week. The lack of time available to fine tune the carburation would come back to haunt us. Frank came on the trip with me, and this was his first trip to the salt for Speed Week. 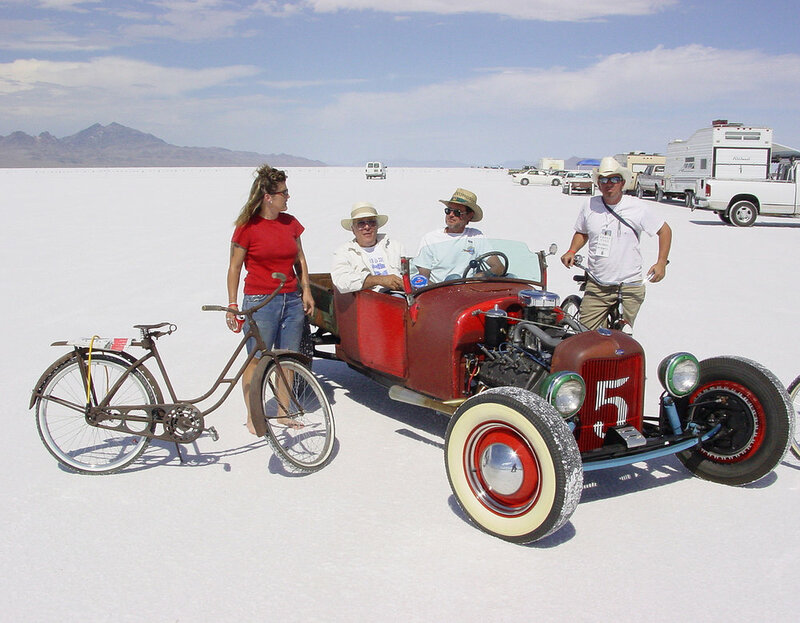 We headed out Highway 50, from Fernley on the old Pony Express route on our way to Austin, Nevada for the Alviso Roadster Reunion. Somewhere past Fallon, we came across two huge cottonwood trees growing next to a dry riverbed. One of the trees was just chalk-full of shoes. All manner of shoes. Frank and I stopped to check it out. Supposedly its been a tradition for newlyweds to go out to the tree, get it on, and then throw their shoes up in the tree. Sounds like a pretty good set up to me. Frank and I did not participate in this tradition. About an hour later we came to Austin, which sits in a little canyon at about 6000 feet. The town seems to slumber half in and half out of the modern world. Despite being so far out in the sticks, it has all the conveniences...three bars, a diner, two gas stations, some models, a great hardware store, and what looked to be a wrecking yard at the end of town. All this, to serve just over 100 souls. Our host Jerry Foreman, has a nice little place overlooking the main road through town, and the cars were beginning to gather by the time we got there. This is the second year for the BBQ, and the word had definitely gotten out after last year. Guys from all over the West were there. Mark Morton was debuting the new Hop Up touring car. Vern Tardel, and a bunch of the boys from over Santa Rosa way were hanging out. Mild Mitch had brought his well known modified. 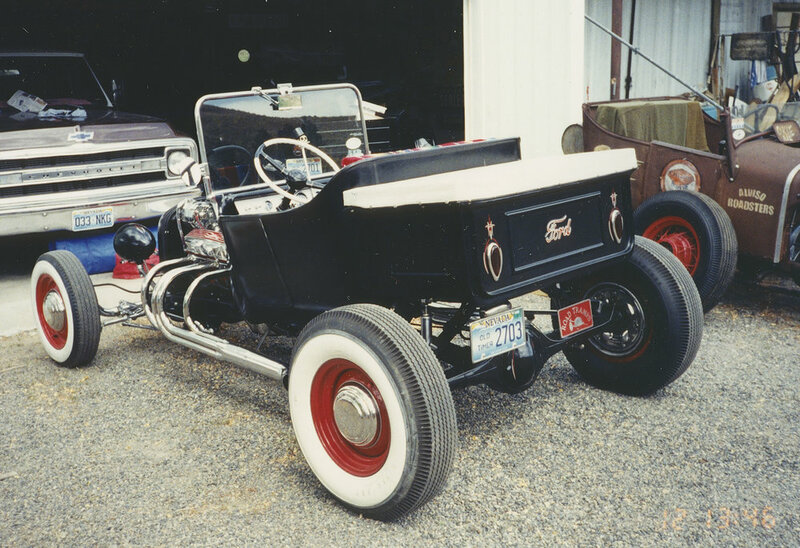 Randy and Chris had their beautiful ‘32 highboy...and it went on and on. The star of the evening was a cool little modified, built as a tribute to Gary Ventimiglia. Gary was a friend of Jerry’s who started building this car, and then tragically succumbed to cancer before finishing it. As a way of honoring him, Jerry, his son Jake, and his friends Joe Malazzo and Eddy Barboza finished it for him, and took it out to the salt. When we showed up, Rick and Joe were fitting the rear wheel bearings. After this was accomplished, Rick put on a crash test dummy outfit and Joe kissed him for good luck. Fat lot of good it did, because Rick almost took out someone’s car and then tried to plunge over a 40 foot embankment. (Remind me not to let Joe kiss me.) Turns out there wasn’t much in the way of brakes on the old dog. Scary as it sounds, this was a moment of great humor. Maybe the beer had something to do with it. The next morning, we headed out to Wendover via Eureka and Ely. Right off the bat we had problems with the Dodge. As you all know, carbs run rich at high altitudes. The Holly carb on the slant six was jetted a little rich to begin with but now at over 6,000 feet and crossing a lot of 7,000 foot passes, things weren’t goin’ well. So we pulled over and did some surgery. After a little float height adjustment and a timing tweak, the truck pulled a lot harder, and a couple of hours later we pulled into Ely for lunch. The Ely hotel is one of those great old places that are a hold out from the turn of the century. It’s full of hunting trophies and western memorabilia. All the waitresses were gravely- voiced old women who referred to us as sweetie, and dear, and hon. The table water tasted like garden hose, and my hamburger was cut in the shape of a buffalo. After lunch we headed north towards Wendover. As we came over White Horse Pass, we began to catch glimpses of the salt flats through the clouds and the rain showers. The desert looks best on the edge of a storm, a light shower dresses it up nicely and makes things look richer and a little polished. The sagebrush is so pungent after the rain passes that the scent clings to you as you speed along. We came down, out of this beautiful landscape, into the nasty and bitter little gambling freak show called Wendover. We arrived on the salt just in time to watch the Tardel-McKenzie Roadster go through tech. Vern was shepherding the car through the inspection process, filling out forms and answering questions put to him, while his crew stood around or removed items for closer inspection. Having featured a story by Kevin Thomson on this car in the pages of Rust, we felt in a small way, like it was our car too. We watched with interest, hoping the whole process would go without a hitch and with the exception of a fire extinguisher inspection tag, or lack there of, it did. As the sun began to go down, Frank and I went and set up our campsite, out on the corner where the road from the highway turns and goes out onto the salt. This is a popular campsite and is the scene of bonfires and partying just about every night during speed week We unloaded the Model T, and right about here is where the wheels fell off the cart. After running great the day before, the old Ford didn’t want to start. I fussed around with it, and finally we pulled it around the truck to get it running. I did one flying lap on the Alkali, with the back end sliding wonderfully, then I headed out the road towards the salt. On the way back, one of the rods began to knock, and the oil pressure spiked at 100 psi. By the time I got back to the camp it was obvious that something had gone south on the motor. I was pretty bummed out that night. At first light, I got up and started wrenching. Frank got up an hour or so later, and the first thing he said was, “I thought I’d find you here.” Which is to say, under the car. Turns out that the number two rod lost it’s babbit bearing. Large chunks of it were all over the sump. This isn’t hard to repair if you have another rod, but model T rods are a little thin on the ground in Wendover Nevada. Right about here is where all those stories about boot leather, and bacon, and brass wire, serving as rod bearings, came to mind. Its also just about when a stiff desert wind picked up and started blasting dirt and alkali everywhere. This was no time for inner engine surgery, so we headed out onto the salt, with the Ford on the trailer, and went about spreading the word about RUST Magazine. We hooked up with our friends, cracked a few barley pops and set up some shade. Racers love to run in the morning, when the air is cool, and thick. By the time we settled into the shade, a lot of cars had already run. You can really tell when a car is going fast, it seems to ignite the spectators. Everyone turns to watch it go by. Seeing a car go over three hundred miles an hour is a real thrill, and the sound is just great. If you aren’t racing you spend a great deal of time hanging out and wandering around just looking at stuff in the pits. You can only do this in short bursts because it’s just too damn hot so you must find shade. This is how you meet people. You hop from pit to pit-seeking shade. Racers and their crews are happy to meet you and tell you about their cars and how their runs went. In the pits, we ran into my Mom’s neighbor from Maine, Dave Rowell. He and his friends were running a competition coupe in c-gas. His friend Richard Samson, who owned and drove the car, died last year. His son Greg was driving the car this year. They got it over 200 miles an hour on the first pass and as you can imagine were very excited. Unfortunately when they went to back up the first run they could only do a little over 180. They think they are a little over carbureted and they plan to do some testing at altitude before Speed Week next year to solve the problem. 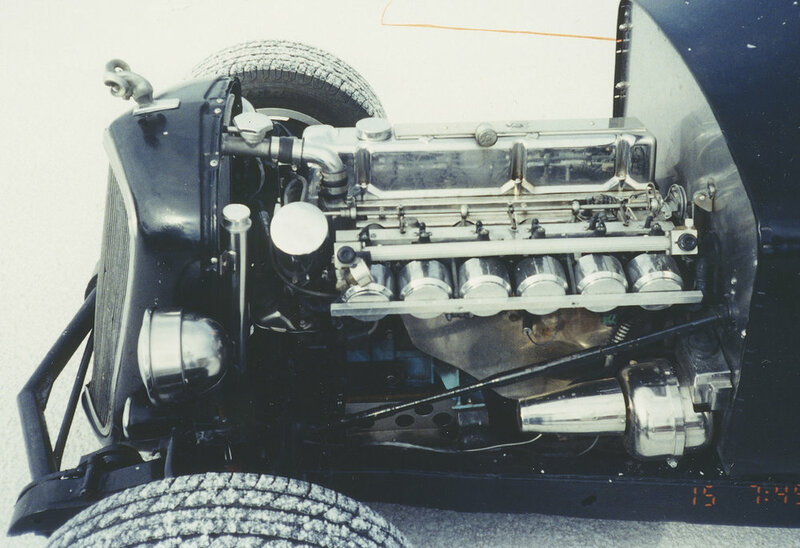 The Tardel-McKenzie roadster set a record at over 165 miles an hour. The car ran strong. I watched Vern take off the heads after the second run, and the engine looked great inside, which was a big improvement over the last time the car ran. Two years ago it was nothing but blown motors for the guys from Santa Rosa. One night it started raining about sunset so Frank and I went and got a hotel room at what turned out to be the drug lord motel. The Mexican guy running the place was covered in gold chains and bracelets and spent the whole time we were checking in yelling at people on the phone or his kids. Yea, it looked grim, but this was Speed Week. Hotel rooms were a hot commodity this time of the year in Wendover, and it was raining. The place looked pretty bombed out with dead cars half stripped on the side of the building. There were a few professional ladies trolling around in the parking lot as well as a few gnarly looking dudes hanging around checking us out as we unloaded the truck. It was starting to look like I’d be sleeping with my pistol under my pillow. But it all worked out ok and the hotel room was one of the cleanest I’d seen in a long time, hell the TV was even new. Mark Morton had set up a photo shoot of several touring cars with Peter Vincent snapping the shutter for an article in Hop Up Magazine. It was interesting to watch Peter set up the cars, and snap the shot. Peter is one of the very best photographers in the country, and you could learn a lot from watching him in action. He really knows his cars and he clearly understands composition but I think his greatest strength is his feel for light. Every night about dusk the wind blew up pretty good. The sky was overcast and rainstorms surrounded the salt flats the whole time we were there. Out of pure laziness I had been leaving the ford on its trailer out on the salt by the pits parked under the eazyup. I used a big tie down strap to tie the awning to thetrailer in an effort to keep it from flying away. This turned out to be a rookie move. Sunday night the wind came up big. When we came back the next morning the awning was still there but it had beat itself to death in the wind. Every joint and most of the struts had broken leaving it a sorry looking mess. In its death throes it had moved the trailer two feet and broken the windshield of the Ford. I felt a little less embarrassed when I went to chuck its remains in the dumpster and found several other broken awnings already in it. The desert has a way of reminding you who is the boss. Only the most robust equipment will survive and then only if you are smart about using it. Monday night we went to the Hop Up Party on the corner. Morty put on a great spread of hot dogs and beer. The cars and the people in attendance were just amazing. This was the best gathering of traditional hotrods I have seen in a long time. There was even a beautiful CASE racer from the teens that had been brought from Utah. Morty paid tribute to everyone that helped out, remembered friends who had passed away in the last year, and congratulated those racers who had been successful in setting new records. It was a great chance to talk with builders and rodders from all over the country. After a couple of hours, the storm that was hovering on the horizon blew in with a strong wind. The cars scattered like quail at a gunshot, and within a few minutes the only cars left were the RUST crew. Frank and I, Kevin Thomson, Ethel, and Canadian John all sat in our cars and watched as the wind blasted and the setting sun turned the storm into a spectacular light show. Peter Vincent was out on the Alkali for a long time, taking pictures as the storm approached. Frank and I headed over to the KOA campground to hook up with our friends Dean and Stace. We figured we would poach a spot for the night and maybe catch a shower if the proprietors weren’t paying attention. After a few beers Scott Mugford and Dean began shooting fireworks out of the back of the truck. This was a little sketchy and it wasn’t long before some guys in a cabin across the way began yelling at us about the noise. About five in the morning one of these tools came over and pounded on the cabin door really loud and then ran off. The next morning, the truck developed a manifold leak so Frank and I went to the auto parts store and picked up another gasket. We replaced it in the parking lot. Frank did some more tweaking on the carb while the intake was off. We thought about heading back out to the salt but we were starting to smell the barn so we headed out on the long Highway 80 trudge back to Cali. Around Elko, we ran into a big storm with so much rain, I didn’t even have to wash the salt off the truck and trailer. The rain did the job nicely. We pulled into Sac about twelve hours later, dead tired, and glad to be home. I had managed to lose my notebook somewhere in the last two days of the trip (drug lord motel maybe?). This is a BAD thing for a journalist. Not only did I lose my notes on the cars I saw and the people I met, but I lost the addresses of two people who purchased RUST subscriptions. If perchance one of you lads reads this please call me and I will hook you up.